Leasing Available from $22.28 per month! Leasing Available from $30.03 per month! Leasing Available from $31.40 per month! The 7010 Thermal printers offer industrial performance in a rugged design for volume production in retail and manufacturing environments. The user friendly design of the printer allows a space saving vertical opening, making the 7010 ideal for small spaces. The large graphic LCD gives a clear indication of printer status and auto switching Zebra and Datamax emulation ensures easy printer configuration. The connectivity goes far beyond parallel, serial and USB. 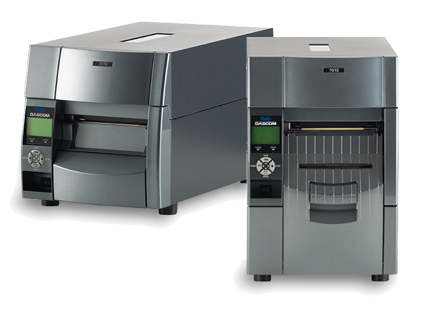 The 7010 series offers a wide range of features and options like internal Ethernet, peeler and cutters. The 7010R features an integrated peeler with liner rewinder for backing paper or labels and easy label dispensing. The 7010-300 with a resolution of 300 dpi is ideal for printing labels with logos, images and graphics. Roll Diameter 8" (200 mm) outside diameter. Core size 1.5" - 3" (38 mm - 76 mm). Note Accessories Supplied: Ribbon sample, Ribbon core, Ribbon handles, Head cleaning pen, Start-Up Guide, CD including: Manuals, Drivers and EasyConfig Tool.